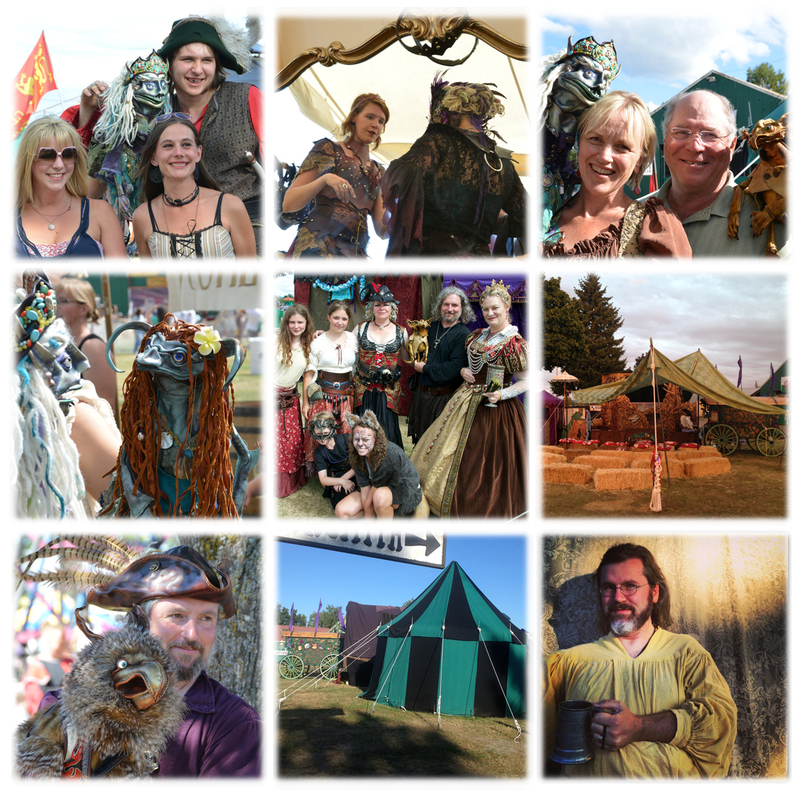 A new event has come to the North West and it called the Oregon Renaissance Festival of Hillsboro. Without going into it too much we heard thru the Billy Scudder grapevine that a new Festival was getting started at the end of August and we were intrigued. Serriffina was on the phone in an instant and pretty quickly had made contact with Vince and Wanda the promoters. They happened to be in town for some reconnoitering so we met them and we were more than happy to say yes. I think Blarney actually sealed the deal when he jumped on the table, told a couple jokes, lost his footing and backflipped into a faceplant on the deck. At the time of this writing I am hanging out in a ubiquitous purveyor of caffeinated bliss and getting prepared for what I hope is another wonderful weekend. One more weekend to go for us but three more for the festival. Rather than give you a rundown of the whole adventure I will tell you some of the things I have learned. 1. Time Travel is possible. I am pretty sure the Knights, Court and Queen have all travelled here from the 1500’s. The person you meet during the joust and other happenings around the festival is the character you meet on the off days. Their attire may be more casual but it is not of this time. The complete opposite of Christopher Reeve in “Somewhere in Time” they are living a life of yesteryear and dealing with the silliness of current technology and perceptions. 2. Be prepared for Torrential Downpours. My original plan was to use the time leading up to the festival to remake our stages so they were weatherproof. That didn’t happen. The two days I spent on improvements were well targeted but I regret not doing it right from the start. Feels like a band-aide over a gushing flesh wound. I now have a very rural Oregon roof. A blue tarp being held in place by bungee cords. eww. Our stuff is still dry though. 3. Heat can melt a crowd. Our worst show ever. In 85 degree sunshine in Oregon meant that by the time ZW finished drumming for Tabatha’s beautiful rendition of “Maid on the Shore” everyone save the 5 people who had found shade beside the Gypsy Wagon had left. I was beyond depressed. An hour after wanting to cry, I rallied, pulled out all the stuff I threw in “just in case” and created a shade structure for the seating area. It has seen use ever since and now only folks offended by poop jokes leave. My little lean-to has weathered howling wind and three thunderstorms now. 4. Buy a Renaissance tent. During one of those incredible “I really need that” moments I plunged in and bought a 12′ circular Black and Green tent online from Midwest Tents. I did it so late (after fretting over the idea for weeks) I had to have it shipped to my friend Steve Smith here in Oregon. With amazing help from Troy and Ellen we set it up on Saturday in the afternoon and I am in Love. The material, shape, color, feel and simplicity have made for a wonderful experience. I will certainly be bringing that to FaerieWorlds next summer. Expect to see it in our lawn during the rest of the summer. 5. Pack Everything you can fit. “Just bring it!” has typically been my mantra as long as it will fit in our van or trailer. Sometimes we don’t use a third of what we bring and I certainly wonder why? Other times, like last night, I was listening to the downpour, comfy in our round tent, watching Izzy giggle to a movie playing on my Mac propped up on a blue bin full of costume bits. I just smiled to myself and enjoyed the moment. She and Bloo fell fast asleep before the thunderstorm hit and never even noticed. Lastly, if you do make it to the Ren Fest,…. Please go and see the Washing Wenches. They are an amazing act and polished to a perfected Gem. I rung the bell but it took me 4 tries. The Exotic Cats and Bird acts are wonderful. Lots of good food and Things to buy. DO NOT MISS THE JOUST. It is great, but where else to you get to Boo someone to you hearts content, over and over again and mean it.